Az Erasmus+-nak köszönhetően 2018 szeptemberében nyolc ország fiataljai lehetőséget kaptak egy tíznapos ifjúsági cserére, ahol vállalkozókézségüket fejleszthették. A Become a Young Entrepreneur programban csoportmunkával egy üzleti ötlet megvalósításának körülményeit vizsgálták. Egésznapos szemináriumokon tudhattuk meg, milyen pénzügyi és marketing vonzata van egy vállalkozásnak. A nyolc ország (Románia, Bulgária, Macedónia, Görögország, Szerbia, Törökország, Moldova és Magyarország) hat fős csapatai informális tanulási módszerekkel sajátították el a marketing és menedzsment alapjait. A cserén nem csak komoly üzleti képességet szereztek a részvevők, hanem a többi ország kultúráját is első kézből ismerhették meg. A magyar csapat a REDI (Roma Entrepreneurship Development Initiative) és az RGDTS (Roma Gadje Dialogue Through Service) együttműködésének köszönhetően vett részt a projekten. The Become a Young Entrepreneur! 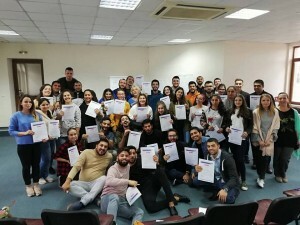 Erasmus+ youth exchange created an opportunity for young people from eight countries to come together and develop their sense of entrepreneurship. 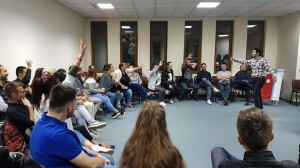 Forty-six participants from Romania, Bulgaria, Macedonia, Greece, Serbia, Turkey, Moldova and Hungary met in Ocna Mures, Romania for the ten-day project, which was held 21-30 September. Young Roma and non-Roma participants took part in seminars each day and got to know the financial and marketing aspects of entrepreneurship. Participants gained knowledge of informal learning methods in the fields of marketing and management, and exchanged ideas on business design, marketing and sound financial planning. During the exchange, the participants were split into different working groups to compete for the best business idea. They had to present their business idea to a specially-assigned jury and show originality, a clear financial plan, and public speaking skills. Young people who attended the exchange didn’t only gain serious skills in business. They also learned information about other cultures firsthand, through diverse working groups within the program and also learning about Roma history, culture and language. Participants were able to visit the Roma Entrepreneurs Business Club in Targu Mures, where they received firsthand information regarding how a business functions. In the end of the youth exchange all participants and their group leaders received Youth Pass certificates. Many participants shared dedication to follow up on their business plans upon their return home. This youth exchange event was organized and supported by the Roma Entrepreneurship Development Initiative (REDI) and its partners: RGDTS (Roma Gadje Dialogue Through Service), Hungary; Center for Community Development Vrastiri, Bulgaria; National Roma Centre, Moldova; United Societies for Balkans, Greece; Roma Youth Association, Serbia; Federation of Mediterranean Roma Associations, Turkey, Romalitico, Macedonia. The event was funded by the Erasmus+ Programme of the European Union. The Hungarian team was able to participate thanks to the partnership with REDI and RGDTS. ← Putren Le Jakha! – Open Your Eyes! – International Youth Conference 2018. APPLY NOW!